A “referral”, when it comes to the online world, is a web page that has a link to your blog. Hence that page becomes a source of traffic to your blog. And how important are referrals? Oh, quite important, if I may say so. Just like in real life where it is important to get good referrals, be it a doctor’s referral or employee’s referral (among many other things), in the online world referrals play an important role in analyzing your traffic and helping you improve your online portfolio. Long time ago, people actually used to pay others so that they could be linked on different websites. Popular websites charged higher fees because they had higher traffic. There was also the popular custom of “link exchange”, where two individuals A and B would put up a link of the each other’s blog on their respective blogs. I think all those practices died down after Google redefined its criteria for determining Page Rank and rewrote its algorithm. They finally realized it wasn’t fair to give a particular website a high PR just because of the high number of referrals alone, because as mentioned above, being referred to didn’t necessarily mean one is popular - It could easily be bought. Enter web 2.0 and a whole new dimension opened up. Today, referrals come in many forms and shapes and sizes. Ever since blogger.com introduced a “Blog List” widget that shows the update of all the blogs you’re following, the number of referral visits to any blog has increased like Kim Kardashian’s derriere. Yup, “Bloig List” certainly made life easier for those who aren’t subscribed to blog feeds through emails or feed readers and aggregators. There are three main types of traffic you get on your blog. 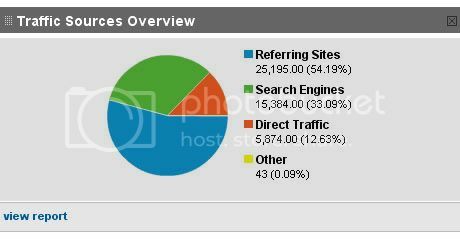 I’ve been blogging for 6 years now, and this is the first time my referral traffic is more than 50% of my total visits! blogger.com’s “Blog List” widget is one of the main reasons for this, as I have never taken part in those “link exchange” programmes mentioned earlier above, or the many referral programmes that “pays you”. The reason I came up with this post is that yesterday, I finally completed one year with e-referral.com on my blog. In case you haven’t notice, there is a list of referring sites on my blog side bar at the bottom, which tells me how people come to my blog, in real-time. Such data is important. Of course Google Analytics too generates such data (and one may argue – a more accurate one) but hey, I’m just trying to simplify this as much as I can for all my visitors. This post is about how you can analyze your incoming referral traffic and look for ways to maintain that clientele or look for grounds where you can create a new niche. I’ll talk about Search engine traffic and how SEO helps you achieve a high SERP rank etc some other time. This post is dedicated solely to referrals. Disclaimer: Before proceeding, I just want to point out that a 100% accurate result cannot be generated on anything that is digital. Even when it comes to visit counters, I use three popular counters simultaneously – Google analytics, sitemeter and stat counter. And they always give me different values at the end of the month, but they all come pretty close to each other. Needless to say, there is a lot to learn from the referrals that you get. For example, if you are getting a lot of referrals from Poetry websites, then it means people appreciate your poems and you need to keep writing and improve on that. If you get a lot of referrals from some of India’s most popular blog conglomerate sites like desipundit, mutiny, blogbharti etc, then it means your writing appeals to the average Indian and you need to focus on ways to go a notch higher. You have to look at other platforms too. Are you getting high referrals from Facebook, Orkut, Digg, StumbleIn, LinkedIn, Twitter etc? For each entity, you need to devise a separate plan to take it to the next level as they are all different. Remember one very important fact: The average blog visitor DOES NOT comment on your blog. They read what you write. Whether they like what they read or not, most people do not leave a comment. So it is wrong to judge who your visitors are based on the comments you receive. That is where referrals play an important role. If you’re a marketing freak, you will be familiar with STP. That is – segmentation, targeting, positioning. How do you position your blog? You have to take so many things into consideration, and not just what you receive on your comments. Around 70% of my referrals come from misual.com , considered as one of the most popular Mizo community sites today. A couple of friends and I run this site and there is a side bar I update once every week on the website, where I list out all the popular Mizo blog updates. What this result shows me is that all the other blogs I update weekly on the site will get high traffic too, even though the people who visit such sites/blogs may not leave any comment. Other community sites like lawrkhawm  and suankual  too give me good traffic. This shows that discussion forum visitors are extremely active and tend to click on external site links that they see (or recognize). I got referral visits from all the social networking sites I have joined - Facebook , Twitter  and Orkut . This means that people who read your social networking profile, tend to click on your blog link if they find your profile/scrap/discussion/tweets interesting. Another useful information I got from my referral traffic is that I have just one popular post at Digg  and one at desipundit . So all those traffic from digg and DP went only to those two posts. And I must confess, there’s nothing great about those posts, except that I wrote them at the right time, when everybody would be talking about it or searching for it. Among the top 20 referrals, 8 personal blogs are in the list. The irony is that I got the highest blog referral from my ex’s blog This proves that you cannot hide from your past relationships. lolz. 195 referrals came from her blog, and since I was linked only once on her blog and that was to my Chor bazaar post, this means that 195 people looking for the infamous “chor bazaar” in Delhi landed on her blog, and then came to my blog from there. Ah. Cheap people. Just like me and my ex. Lolz. This is followed by Pixie  who recently moved to her wordpress blog. Definitely one of my dearest blog friends, whose real life identity I do not know. But then, that’s what online life is supposed to be anyway, right? After her comes Sekibuhchhuak , Father_Sphinx , Claytonia Vices , Zaia , Sunshinejoy  and Chhangte . Thanx a lot you guys, for being such a good source of traffic. Last but not the least, Google , Yahoo  and AOL  also feature in my top 20 result. But this is where e-referral goes wrong. I am getting search engine results too under google, yahoo and AOL referral result. They are supposed to be organic results only, which means webpages from google, yahoo and AOL that are not search results. That can mean yahoo mail, gmail, etc. Because if search results are supposed to be included, then my search engine traffic is 15,384 during this past one year. The above three figures definitely do not add up to it, even if you throw in a few extra results for Bing, Ask, and other search engines. Like I said, you can’t have an accurate result, but if you analyze the result that comes closest to it, your job is done. The most important thing is, don’t be a traffic whore, but if you are serious about blogging, then it is important that you start analyzing your traffic and understanding what your visitors want or like. Don’t depend on the comments alone. Cheers everyone. I'm not too particular about the traffic Kima. People who understand me and enjoy reading what I write are enough I suppose. @ Pixie: Well sometimes I'm sure you must be a little bit curious as to know who your visitors might be (among those who don't leave comments) right? :) Its like you have this beautiful house and you just feel like knowing who all came to visit you, instead of just opening the door and making it a free for all. Something like that. lolz. nice post. I remain as dumb as ever even after 5 yrs of blogging. Thangkura tih ang deuhvin'Ka la hre thiamchuang lo'.Mahse a lamhawi deuh chu kahriat phah in ka hria. @ Blind: You're welcome. And I will try to keep maintaining that section and discovering new bloggers as long as I am able to. fascinating! am now going to read that post again, *slowly. thanks! A ni e. Ka lawm e.
Kima.......How are u mate....................This is Mohammed from Saudi..........Ur Classmate in Montfort.............can you send me your number to my mobile 00966554054419..........I need to discuss a Project with you..I think you would do a great job at it...............I would be landing in Mumbai on the 25th Nov afternoon.........i do have a hectic schedule but it would be nice if i could brief you through the phone first before we could meet. Very informative..but still too complicated to put dat to practice for someone like me..but hey, as long as ya keep writing, we'll keep ourselves glued to it..keep it up!!! I am serious about blogging but i don't worry too much about my incoming traffic. At one point this would have filled me with ineffable joy. Now adding this to the creation of a post just makes me feel exhausted. @ Alej: You've just joined man. Don't worry, you will grow in due time. Patience is the key word here. @ Mohammed: Thanx bro, was real nice catching up with you. Looking forward to 26th. hehe. @ Zualbonez: Oh I didn't know about it. Thanx for letting me know. Jim will always be remembered by us. May he always rest in peace. Chp 276. Velvet Lounge, Mumbai - Review.